This is a supplement issued with the Brewer's Journal. 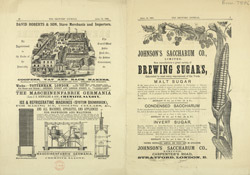 It features an advertisement for Johnson’s Saccharum Company. Saccharum is the Latin word for sugar. Plants in the saccharum family are tall grasses and the most well known is sugar cane. In the brewing world this is known as invert sugar and is used in the preparation of ales and porters. It gives the beverages a particularly sweet and full flavour. Porters were especially popular drinks with the working classes in 19th century Britain, they were inexpensive, low in alcoholic content and were full of flavour.